Tags: 4AD Records, Adrianne Lenker, Big Thief, Buck Meek, James Krivchenia, U.F.O.F. 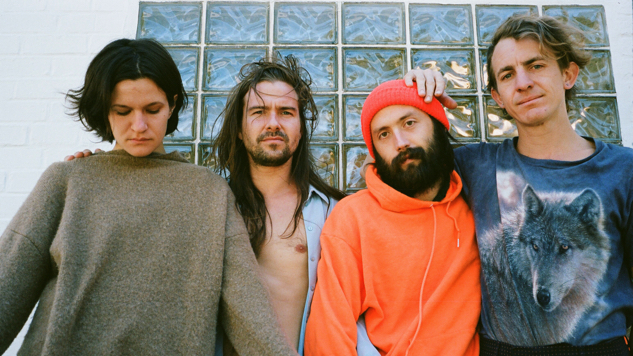 The next new single from Big Thief’s forthcoming effort “U.F.O.F.” (Due May 3rd on 4AD Records) has landed: the rustic “Cattails,” which follows on from the album’s gorgeous title track, released alongside its announcement in late February. “Cattails” opens on Adrianne Lenker’s jangling, finger-picked guitar and James Krivchenia’s steadfast drums before it’s later built out with a slow-rising synth hum and gleaming piano stabs. “Going back home to the great lakes / where the cattail sways / with the lonesome loon / riding that train in late June / with the windows wide by my side,” sings Lenker, her thoughts in transit somewhere between civilization and nature—she later insists, “you don’t need to know why / you don’t need to know why / when you cry,” deferring to the mysteries that run deep within the human heart. “Cattails” came about while we were at the studio in Washington in the pine forest. Writing it was just one of those electric multicolored waves of connectivity just sweeping through my body. I stayed up late finishing the song and the next morning was stomping around playing it over and over again. We thought why not just record it, so James sat at the drums and we practiced, and by the time we’d finished practicing, Dom Monks—our engineer—had already sneakily set up mics and recorded it. It was beautiful that he’d captured it right away because when James and I were playing, it felt like a little portal in the fabric had opened and we were just flying. Listening back to it makes me cry sometimes. ‘Cattails’ by Big Thief, from the new album ‘U.F.O.F.’, released May 3rd on 4AD.